Yesterday, the governors of California and New York signed laws that would gradually raise the minimum wage in those states to $15 an hour. 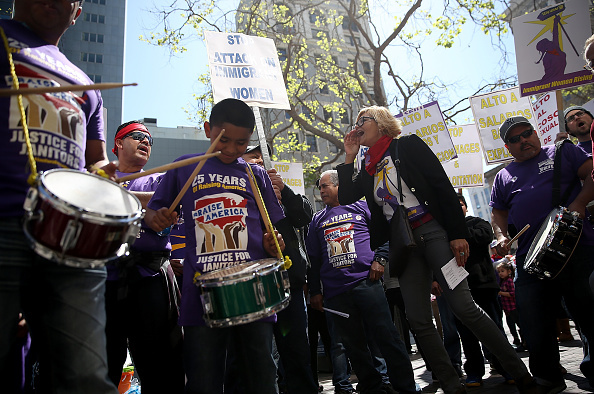 The new laws were cheered by labor unions and other advocates for low-wage earners. They say the increase is necessary for workers trying to pay the high cost of living expenses. But business groups warn that higher minimum wages will cost thousands of jobs and lead to higher prices for consumers. Diane and a panel of guests discuss the debate over raising minimum wages in the states and what it could mean for consumers, businesses and the 2016 presidential race. MS. DIANE REHMThanks for joining us. I'm Diane Rehm. Yesterday, California Governor Jerry Brown and New York Governor Andrew Cuomo signed laws to gradually raise the minimum wage to $15 an hour. They became the first two states in the nations to pass a $15 minimum, joining about a dozen other cities around the country. Here to talk about how businesses are reacting and how the issue is playing out on the presidential campaign trail, Ben Spielberg of the Center On Budget and Policy Priorities. MS. DIANE REHMJoining us from Los Angeles, Christina Bellantoni of The Los Angeles Times and from Kansas City, Missouri, Michael Saltsman of The Employment Policies Institute. I do invite you to be, as always, part of the program. Give us a call, 800-433-8850. Send us an email to drshow@wamu.org. Follow us on Facebook or Twitter. And thank you all for joining us. MR. BEN SPIELBERGThank you so much for having us. MR. MICHAEL SALTSMANGood to be here. REHMChristina, I'll start with you. Tell us about the California law, how it's going to be implemented and how long it will take to actually reach that $15 an hour level. BELLANTONIYeah, workers who were cheering this decision yesterday or signing it into law yesterday, you know, should be aware that it's going to take six years until a wage reaches $15 per hour. It phases in a 50 cent increase in the current -- next year. On January 1, this year, we actually raised the minimum wage from $9 an hour to $10 an hour and that's statewide. Many cities have a higher wage, which I know we'll talk about. BELLANTONISo then, we'll have another 50 cents on January 1 and then it'll go to $11 and then it'll gradually go up every year by a dollar, unless there's an economic recession and then, Governor Jerry Brown or his successors, any governor, can have sort of an economic offshoot to be able to say, we pause this. And for small businesses, anyone with 25 or fewer employees will have an extra year to take effect. But the big difference with our minimum wage measure is that it is indeed statewide so it supersedes any lower wages in cities. REHMAnd what about New York, same thing? BELLANTONISo New York's is a little different. It's going to take effect in New York City first. That'll be the first one to reach the $15 and then they'll have sort of regional programs to increase it gradually without as much structure as the California program. And, in fact, California leaders were -- they were beat by Governor Cuomo by about an hour, who signed it about an hour earlier than Governor Brown, but they were saying theirs is far more progressive and that they were first because they passed theirs last week. REHMNow, the question comes, does this really satisfy workers to have it moved so slowly, so gradually and even be, perhaps, subject to some kind of slowdown if a slowdown economically occurs? BELLANTONIYou know, that's what a lot of workers are -- they're very excited about this at this point, but we've been talking to people in places where the wage is higher. For example, there's a city in California called Emeryville, where it's $14.44 or it will be by the time they phase it in and workers are talking about things like it's still very expensive for them to live in that region. They haven't -- it hasn't made a huge difference in their bottom line. It hasn't changed the way that they spend. BELLANTONIAnd you're hearing, especially from a lot of restaurant owners saying, we just keep having to raise our menu prices to be able to pay our employees this wage. And I had a call from a small businessman yesterday who said, you know, nobody's talking about the extra payroll taxes or workman's compensation we're having to pay on this. So effectively, for him, he's looking at an $18 minimum wage. BELLANTONIAnd, of course, you know, the argument that the supporters of this say -- and it was all Democrats who supported this, by the way, not a single Republican vote -- are saying that this will just lift everyone up and that maybe it doesn't even -- Jerry Brown said yesterday, it might not make the most economic sense, but it actually makes moral sense and this is what we need to do as a state. REHMChristina Bellantoni, she's assistant managing editor for politics at The Los Angeles Times. Ben Spielberg, these are two of the biggest states in the country. Do you see a tipping point here? SPIELBERGSo I don't know if I would necessarily say a tipping point. I think what we're seeing in New York and California is an outgrowth of a movement that's been going on for a longer period of time, since 2012 and this is the next step in the journey, I think, for the Fight For 15, in terms of what they're advocating for. I do think what's really significant about New York and California is that about 18 percent of the workforce lives in New York and California and the number of workers that are affected by these increases is very large. SPIELBERGIn California, the estimate for the number of workers who would be effected is about 5.6 million. In New York, it's about 3 million. And in both of those places, that's around a third of the workforce. So there are a lot of people who are gonna benefit from these increases and I think that's one reason that workers are viewing these as such big victories. REHMWhat about cities around the country which have acted on their own? SPIELBERGYeah. So there are a number of cities as well. There are actually, right now, 29 states plus D.C. that have minimum wages above the federal level and then there are cities, such as San Francisco, Seattle that are going to $15 an hour as well and several other cities that have been attempting to pass minimum wage increases, in some cases successfully and in some cases not quite as successfully. But this is a movement that I would say is certainly happening at the local, state level around the country. REHMAnd that raises the question of whether the federal government might be spurred to move on this issue. SPIELBERGYeah. No, I mean, I think the federal minimum wage has been stuck at $7.25 an hour since 2009 so it's definitely declined in terms of its purchasing power and real value for workers. It's well below where it was at its peak in 1968 and relative to both the average wage and the median wage for workers in this country. So I would definitely say it's long overdue for a federal minimum wage increase as well. REHMBen Spielberg of the Center on Budget and Policy Priorities. Turning to you, Michael Saltsman, how do you react to what the governors of New York and California have done? SALTSMANWell, I actually thought Jerry Brown's sentiments there about this maybe not making economic sense, but making moral sense were pretty telling. The fascinating thing for me about the Fight For 15 is that it's no longer just business organizations and small businesses that are warning or acknowledging that job losses are going to occur at these wage levels, you know. At a $30,000 minimum wage, you actually have left of center groups and advocates, folks like Michael Reich at UC Berkeley who have put out studies acknowledging pretty significant job loss. SALTSMANSo in New York, for instance, Berkeley put out a study showing that they thought 77 to 78,000 jobs would be lost in New York by the time the state goes to $15. Now, they couch that and they say, well, we think some other jobs will probably be created so we think there's going to be an offsetting effect. But that's pretty cold comfort if you're one of the 77,000 people who finds their self without work. REHMSo what is the evidence that thousands of people are going to lose their jobs? I've certainly heard this many times on debates over raising the minimum wage, but I wonder if there really are good, factual statistics. SALTSMANYeah. You know, I suspect Ben and I could probably go back and forth all morning about what the research literature says on the minimum wage. I think that if you read it sort of broadly and critically and look at kind of the best and the most recent studies that they show that past minimum wage increases have caused a negative impact on employment for the people who are least skilled or experienced. SALTSMANAgain, there's a debate going on about that based on some more recent studies, but I think the notable things here is that when you talk about going to 15, you're really talking about going to really what is an unprecedented level. I mean, historically, since the 1930s, the inflation adjusted value of the federal minimum wage is about $7.40 an hour. So when you talk about a $15 minimum wage, you're more than doubling that. SALTSMANAnd I think that's why, you know, even people like Katharine Abraham, Harry Holder, people who have come out of the Clinton and Obama administrations have supported, say, a $10.10 minimum wage, but they've been unwilling to go as high as $15. Even Alan Krueger sort of famously wrote this op-ed for the New York Times, Alan Krueger of the Card/Krueger study, the New Jersey study, you know, he said he was comfortable with 12, but not 15. And so when even they're sounding the warning alarms, I think we should be asking questions about how much sense this number actually makes. REHMMichael Saltsman, he's with the Bureau of Labor Statistics. And if you've like to join us, 800-433-8850. Christina, I know you wanted to comment. BELLANTONIWell, one argument you heard very specifically here in California is we have a lot of big cities. Silicon Valley is a place where housing prices are ridiculously expensive and people have these inflated salaries. Los Angeles, you know, there's a very wide economic disparity. And so what you have heard from legislators is that they believe the cities are going to further outpace them. Los Angeles already has a higher minimum wage than the statewide minimum wage and they see that this is probably going to happen in places like San Francisco and maybe San Jose. BELLANTONIAnd Los Angeles will now be spurred to increase it even further at a more rapid clip. So it's not just the $15 an hour. But the other part of this is that the labor unions had a huge part to do with this. One of the reasons this passed so quickly in California is because a ballot initiative that would've taken this to the voters and gotten a lot of people out to the polls in November had qualified for the ballot to raise it at a more aggressive pace. So I think that that is a political dynamic. REHMChristina Bellantoni of The Los Angeles Times. Short break here. Your calls, your email when we come back. Stay with us. REHMAnd welcome back, as we talk about the signing into law of a new minimum wage of $15 an hour by both California and New York, to be brought into effect gradually over a certain amount of time and with certain increases as they go. Here in the studio is Ben Spielberg of the Center on Budget and Policy Priorities. Joining us from Los Angeles is Christina Bellantoni. She's assistant managing editor for politics at the Los Angeles Times. And from Kansas City, Mo., Michael Saltsman, research director at the Employment Policies Institute. He's former field economist at the Bureau of Labor Statistics. REHMWe have an email here and it says, I could probably count on one hand the number of 16 year olds that need or deserve $15 an hour. Doesn't this movement immensely increase the difficulty for kids to enter the labor market? It puts them in the classic catch-22, they can't get work experience because they don't have work experience. Ben Spielberg. SPIELBERGSo the vast majority of minimum-wage workers are adults. Under a proposal to raise the federal minimum wage to $12 an hour by 2020, 89 percent of the workers affected would be 20 years old or older. In California, the proposal that was just signed by Governor Jerry Brown, 96 percent of the workers affected by that proposal would be 20 or older, and 58 percent would be 30 or older. So I think it's really important to keep in mind that the main effect that these increases will have are on adults who typically do really need the money. SPIELBERGNow, when we talk about teens, I think that's an important thing to think about too. But the solution is not to hold down wages for everybody else. I think the solution is to make sure that we have great education programs, great training programs and other measures that can help those people get connected to the labor market. REHMHow do you see that, Michal Saltsman? SALTSMANSo I actually, I think it's an important point because, as he pointed out, $15 an hour, $30,000 a year for someone who's just getting started in the workforce. If we look at the states right now that are considering this, California's being a good example, you know, in California there's a -- close to a 21 percent youth unemployment right now. You actually have some counties in California where the overall unemployment rate is close to 20 percent. And so these are markets where, you know, when you're making $15 an hour, you're making more than half the people in the metro area are making. SALTSMANSo what you're saying to an employer is, you need to take somebody who doesn't have a day of experience and you need to pay them $30,000 a year. Now, there's kind of been this idea that, well we don't really know what's going to happen at $15. I think the idea that we don't know what's going to happen at $15 is more accurately stated as, we don't know how bad it's going to be. It's kind of like, you know, your doctor telling you, you shouldn't eat five donuts a day but wondering if maybe ten donuts a day might do some good for you. It doesn't really make sense. SPIELBERGSo I do want to talk a little bit about the research that Michael mentioned before and I think he's right that we could go back and forth on this a lot. But I think it's worth pointing out both that the minimum wage is one of the most studied issues in labor economics and that we've been doing experiments about the minimum wage for the past 20 years without any sort of the disastrous effects that opponents of the minimum wage have talked about. REHMSo how do we know what to make of these different results? SPIELBERGWell, so what I would say is a couple things. I mean, I think the first thing is, even if we take the concern that there might be some employment effects into consideration, I think the right way to think about those employment effects is in terms of an overall, aggregate hours reduction rather than a job loss, in the sense that a worker may be looking for a job a little bit longer if that actually does occur. But when they do find a job, it'll be a higher quality job and that worker may be better off over the course of the year because their higher earnings from the higher quality job will trump whatever hours reduction they have. SPIELBERGThe second thing that I think that's really important to keep in mind when we think about, again, this very uncertain scenario where job loss may occur -- and, again, I think the research in general suggests that that's not a particularly likely scenario -- but even if it does happen, I don't think the right framework is, we want a minimum wage only if there is no effect on employment. I think the minimum wage a lot of people see, not just does it make economic sense, but it is a moral imperative that, if people are working full time, they should be able to earn a decent living wage. SPIELBERGAnd when there are negative effects, we can think about how the minimum wage is just one of many policies in the labor market that can help connect people to jobs. And we can think about those other policies as well, to deal with the populations that I think Michael and I are both concerned about. BELLANTONIAnd this is actually, to make Hillary Clinton's argument for her, just one of the things that she says in arguing for a $12 an hour national minimum wage instead of a $15 an hour one, is that each state is very different. And you see that play out in California where you have these very different regions, where you have agricultural industry that's very strong but definitely has a different kind of economic machinery, and then the tech bubble and retail and consumerism and also tourism, you know, these big industries that are vastly different in California. BELLANTONISo each state is going to react differently, whether they have policies in place to help employers as you go, whether there's higher taxes in those states. I mean, California has some of the highest taxes that you can have. And the other part of this you have to keep in mind is that workers, many of them have more than one minimum-wage job. And that was an argument you heard, particularly on the floor of the legislature, saying, you know, this might actually help a family that has someone who's working three jobs for minimum wage. BELLANTONIMaybe they can have two jobs for minimum wage and that will actually improve their quality of life and the time that they can spend with their children, teaching them, which can then have all of these ripple effects down the line. I mean, that's the moral argument that you're hearing Jerry Brown and others make. SALTSMANSo I think that when, you know, there was a headline in The Washington Post the other day that sort of made the point that Ben just made. And the headline was something to the effect of, 15 will destroy jobs and that's okay. And there was some gentleman quoted in the article saying something to the effect of -- that maybe these are, he used the word crappy jobs that shouldn't exist anyway. And I think, when you have a situation where, you know, on average 1,500 young people dropping out of school every day, where you have urban areas, some urban areas where the youth unemployment rate is 30 percent, what we're talking about is creating an environment where the bottom rungs of the career ladder just don't exist anymore. SALTSMANI mean, even to put in context that figure that, again, that proponents acknowledge in New York, 77,000 lost jobs, if only that -- if that was only teens, that would mean one out of every three employed teens in the state would no longer have work. So what do we do for them when they no longer have work? Where do they go? Do they become a lost generation that's less employable and less able to achieve things in life because we've decided to raise the level at which they have to provide, you know, $30,000 worth of service to get in the workforce. REHMMichael, is, in your view, $7.20 a fair minimum wage? SALTSMANI think the question with the minimum wage shouldn't be, is it a fair wage? I think the minimum wage should be viewed as what it is, which is a wage that allows someone to get started in the workforce. We had, you know, Bill Clinton, in the early '90s, campaigned on this idea that policies like the Earned Income Tax Credit, for instance, could more effectively pull people out of poverty. I think we need to shift this so we're not thinking so much about the minimum wage as something that is -- has to be something that, you know, you raise a family of four on, because most of the people earning a minimum wage aren't raising a family of four. We have to think of it as a wage that allows people to get into the workforce. SALTSMANAnd then we should have policies like the EITC in place to supplement that wage and to lift that wage up. I mean, if you're a single parent with two children already, depending on the state you live in, your minimum wage already is $10, $11, $12 an hour because of the supplements we provide with the EITC. SALTSMANI think it's a more intelligent way to do things that doesn't put jobs at risk. SPIELBERGSo the Earned Income Tax Credit is a great policy. And I think we think of the minimum wage and Earned Income Tax Credit as really important complements to each other. And so both the minimum wage should be raised and the Earned Income Tax Credit should be strengthened. One reason they're really complementary is the Earned Income Tax Credit generally is paid out to workers only once a year, so they can save and budget for a larger purchase when they get that Earned Income Tax Credit. But minimum wages are in their paycheck every week, every month. This is money that people who are struggling to get by can spend when they need it. SPIELBERGNow, the -- I think the aspect of Michael's response that I would take issue with is this idea that the minimum wage is a starting wage. Again, the vast majority of workers who are working at the minimum wage are adults. And many of these workers -- in fact, on average, these workers provide more than half of their family's income. So I think the idea that this is mostly targeted at teenagers is just not true. And then, when we think about teenagers, I, like Michael, am very concerned about that population and want to make sure we can connect them to the labor market. But I don't think the way to do that is to hold down wages for millions of people who need it. REHMAll right. And joining us now from Brooklyn, N.Y., is Naquasia LaGrande. She's a fast-food worker and leader in the Fight for 15 movement. She's 24 years old. Welcome, Naquasia. MS. NAQUASIA LAGRANDEHi. How are you doing? REHMI'm good, thanks. Tell me what your reaction was when you heard that Governor Cuomo had signed the new law? LAGRANDEI was -- when I first heard it, I was definitely, like, speechless and so -- and just like so lifted, because there's no one than me, being one of those, you know, 200 workers who walked off the job back in 2012, you know, not knowing, you know. They said I was crazy. They said, you know, I want to make it happen. And the fact that Governor Cuomo made this bill pass, he definitely changed 10 million workers' lives around in so many ways that you couldn't imagine. REHMTell me about your experience working for Kentucky Fried Chicken, KFC, in New York City. How much were you earning there and why couldn't you earn or work more hours to earn the money you needed? LAGRANDEWell, you -- well, like I tell people, at the time that I was working at KFC in Brooklyn, I was making $7.50. And I was getting some hours. But this is not the reason why I stood up to have a voice for the people. It was people like single mothers and single fathers who I knew at the time. If I was getting 35 hours a week and I'm only seeing $250 or barely $250, I could just imagine a single mother who's working the same hours as me and had to take that check and find out --- and to split that in between rent, bills, making sure she could feed her children, making sure she could put clothes on their backs. REHMAnd you're listening to "The Diane Rehm Show." Naquasia, you started at the KFC store in July 2011. REHMYou were making $7.50 an hour. REHMHow long did you work before you got your first raise? LAGRANDEOkay. I remember when I went on my first strike, the week of -- literally a week later, they offered me a $0.20 raise. REHMSo then you were making $7.70 an hour. REHMAnd then, I gather you went up to $8 an hour on January 1. REHMSo tell me how somebody who makes $8.00 an hour can survive in New York City. LAGRANDEYou can't. You can't survive off $8.00 living in New York City. REHMHow were you living? Who were you living with? LAGRANDEI mean, I'm just living in a two-bedroom apartment with five other people. So, you know, you tell me where I was sleeping. I had to decide whether either to give me some lunch for today or get this metro card to go to work, or whether I wanted to pay my phone bill or put frigerator -- or put food in my frigerator. You know, it was things like that where I still, you know, had to choose between the two, like it was like I'm choosing between life and death. REHMIt actually -- I was surprised to learn how long it took you to get to that KFC store that you worked at. LAGRANDEYeah. I basically had to work an hour to afford to get back and forth to work. And it took me at least about an hour and a half to get from one side of Brooklyn to the other. REHMAnd now you've moved to North Carolina. Tell us why. REHMI understand you're working at a McDonald's there. How much are you making each hour? LAGRANDEI'm making $8.00 an hour being a manager at this McDonald's. REHMAnd that being a manager. So in North Carolina, there is no movement toward raising the minimum wage that you know of? LAGRANDE...there's workers out there in the front line who's trying to make it to happen for them. And, you know, we're not going to stop until all 64 million workers around this country get $15 in the Union. REHMNaquasia LaGrande, after participating in five strikes backed by the Service Employees International Union and the local New York Communities for Change group, Naquasia was invited to the White House in February 2014 for her work as an activist and to watch President Obama sign an executive order. Naquasia, thank you so much for joining us. LAGRANDEThank you for having me. REHMAll right. Thanks a lot. And short break now. When we come back, we'll open the phones. Stay with us. REHMAnd it's time to open the phones. We'll take your calls, 800-433-8850. First to Rochester, New York. Alex, you're on the air. ALEXHello, Diane, thank you for taking my call. ALEXI try to listen to this show every day if I can. ALEXSo my comment is on, obviously on this issue. So my wife owns and runs a couple of small clothing stores, and she employs primarily part-timers. And this is going to be hitting her pretty hard. And besides the -- well, besides all the things just with the increased budget for payroll, what I haven't heard mention was that this increase would not allow her to reward better workers with pay increases. ALEXCase in point, minimum wage went up on January 1 in New York, and one of her better workers asked for a raise, but her raise went to the other four workers in the store because she had to increase the minimum wage she was paying. She is primarily employing part-timers, who some, I'll be honest with you, don't deserve $15 an hour for hanging clothes on the racks. If you look at New York state starting teacher salary, it's $41,000 a year, which means about what, $20.50 an hour. A teacher who goes to school for how many years would be paid close -- would be paid close to the person who simply just hangs clothes on the rack. REHMAll right, and do you want to comment, Ben? SPIELBERGYeah, sure, I'd love to. So I definitely think that it's really important to keep in mind how businesses are affected. And I think one thing that's often lost in the discussion about these minimum wage increases is the fact that they are phased in gradually, over several years. So I think when you look at the New York and the California proposals, these were compromises that advocates of the Fight for 15 reached with people who were concerned about how it would affect businesses, and they decided on the phase-ins to try to make sure that businesses would have time to adjust things like their prices, for example, to account for what's happened. SPIELBERGBusinesses do have a few other mechanisms also to absorb the cost, which is probably why we haven't seen the types of employment effects in the past that people are concerned about. There are productivity improvements that can come from raising the minimum wage in terms of increased worker morale. Also businesses can look to cut costs elsewhere when that increase happens. And lastly the other thing that can happen is that there can be somewhat smaller profit margins to absorb that wage increase, and especially given the levels of inequality, I think that's a very good thing. SALTSMANWell, I think in an industry like the retail industry or the restaurant industry or the grocery industry, you'd be hard pressed to have even smaller profit margins than the two or three or four percent margins that they're already earning. But I mean, I think Robert identified what is really an important dynamic here, which is the price dynamic. SALTSMANI mean, if businesses were always able to pass off their costs through higher prices, we wouldn't be having a debate on the radio about the minimum wage because every time it goes up, businesses would just raise their prices accordingly. It's because consumers are price-sensitive that we have this tension. And, you know, Christina mentioned Emeryville, California, earlier, where the, you know, the minimum wage has gone to $14. Well, in Emeryville, California, you can buy pizza for the people at Lanesplitter Pizza, where a specialty meat pizza costs you $30. SALTSMANYou know, where I grew up, you know, a Hot-and-Ready pizza for $5 was more what I was accustomed to, and I suspect most customers in most of the country are more accustomed to those kind of prices, as well. And so when you can't offset it through higher prices, this is why economists are concerned about job loss, and this is why we have seen job loss in the literature. BELLANTONIWell, one just element I'll add to this debate is that it's not just retail workers. You know, there were a lot of people testifying in California who are in-home care workers, who are either caring for their own child, maybe a disabled child, or doing homeschooling or are working at someone's home who is disabled and caring for them, and, you know, they're working for big firms that are making, you know, high profit margins. And they are making this minimum wage. REHMAll right, here's an email from Rich, Christina, who says, if the minimum wage is increased, won't business increase prices to compensate for it? When that happens, it seems as though it will decrease the benefit of the wage increase. BELLANTONIIt -- that is definitely something that we're hearing from businesses. One argument you heard from Emeryville was, you know, the price of a latte will go up from $4 to $4.75 or something like that in one of our stories at the LA Times. But I can tell you that a lot of minimum wage workers are not buying lattes for $4 period, and that's just something that the economy works in scales. And I'm not an economist, but that is, you know, what we are hearing overwhelmingly business owners are worried, workers think that this is going to help them, and somewhere in between you're going to find the answer that might be right for California, and maybe it's not right for Kansas. SPIELBERGSo I wanted to say two things. One is that the price increases aren't one to one. So businesses don't pass through everything into prices, which is I think a large part of why even the workers who are consumers still come out ahead. I think the other thing that's really important to remember is that a lot of businesses are very supportive of minimum wage increases. There is a coalition called Business for a Fair Minimum Wage that has a lot of businesses signed on to supporting the increase at the federal level that's been proposed to $12 an hour. SPIELBERGThere was an article in the Washington Post yesterday that had a survey of about 1,000 businesses, where 80 percent were supportive of raising the minimum wage at least somewhat, only eight percent opposed to it. And I think what businesses recognize is that when there's more money in workers' pockets, that is greater demand for their products, in addition to the fact that this is just an important moral consideration to make sure that workers are making enough to get by because we heard Naquasia's story. REHMThis is interesting, an email from Alan in North Carolina, who says part of the North Carolina LGBT discrimination law passed recently included prohibiting any local minimum wage legislation. So no municipality can set a higher minimum wage. Do you know about that? SPIELBERGYeah, so I mean, this is part of something we've been seeing at the state level a lot. I mentioned before that there is some local minimum wage increases also that have not been successful. And what I was referencing was Birmingham, Alabama, recently tried to raise their minimum wage to $10.10 an hour, and the state stepped in and pre-empted that increase and actually said you can't pass any ordinances that have to do with workplace regulation, something similar to what happened in North Carolina. SPIELBERGAnd I think it is a troubling trend because what people on the ground are reacting to in cities and states that are taking action on their own is a federal minimum wage, again that's been stuck at $7.25 since 2009. REHMExactly. Christina, is there any movement in your sightlines on the federal level? BELLANTONIOh gosh, well, I don't think so. I think it as hard enough for Obama to even call for what he called for in his State of the Union Address, I guess now it's been three years, let -- and the change he made with federal contractors. I don't see any movement at all in Congress, even if you had Democrats in charge. I think this is just a difficult political issue. BELLANTONII was going to say about the North Carolina issue is that this one of the great things about America. I'm not an economist, but I do study political trends, and, you know, businesses do have opportunities to go elsewhere. We just got an AP news alert saying that PayPal has canceled a massive investment it had in North Carolina because of that very law. And businesses could leave California if they choose. I mean, I hope they don't, just as a Californian, and, you know, I like the economy to be strong no matter where I am or other people are, but this is one of the things that you can do. You can look at the states' policies and look at where you want to live, and you can leave. BELLANTONIAnd minimum wage workers often don't have that ability to make that choice, particularly in places, Southern California. REHMAll right, let's go to Matt on Long Island, New York. You're on the air. MATTGood morning, Diane, how are you? MATTThank you for taking my call. So very, very briefly, I own a, I guess, middle-sized company here on Long Island, about 300 employees, and we are in the security services industry. Obviously with the Affordable Care Act coming into play and the minimum wage increase, you know, we pay our employees between $10 and $12 an hour, not including all the taxes and everything else. My question really is to the panel and to yourself, is what is the benefit to the employer other than a skilled workforce? REHMWhat do you say to that, Ben? SPIELBERGWell, so I would say besides the skilled workforce and I think failing having boosted employee morale and hopefully productivity improvements that come along with that and the moral considerations involved, I do think the enhanced consumer demand from having a workforce in the area that is better compensated and has better health is really beneficial. REHMBut are the customers going to be willing to pay more for that security service with the rise in the pay? SPIELBERGI think so, and I think we can see that in the survey data about how the public views the minimum wage. There was a survey in January that found that 75 percent of Americans believe that a $12.50 proposal at the federal level, phased in by the year 2020, would be beneficial. And 53 percent of Republicans actually agreed with that. So I think this is an issue that has very broad-based support among the populace, regardless of political party, actually. REHMAnd looking at the political situation going on, we have a tweet. Would this have happened now, Christina, if Bernie Sanders had not been pushing the issue on the campaign trail? BELLANTONIOh gosh. I think so, just from what I am aware of in the New York legislature, you know, what their process has been and what Cuomo has been saying for a long time and what has been happening in California. I mean, they increased the minimum wage from $9 to $10 last year, having this argument with the labor unions, sort of with this threat of the ballot initiative hanging over them. BELLANTONIWould we be having the conversation in the same way? Maybe not. I mean, there's no doubt that Senator Sanders has pushed this conversation among Democrats as they're taking their campaigns through all of these different states more to the left. And there's no doubt that Hillary Clinton is talking about this more because he has put her there. But it gets back, I'm a little bit of a cynic, you know, what I was just saying about Congress and do I think a federal minimum wage increase is in the cards, it just doesn't seem to be. SALTSMANI think giving credit where credit is due is important here. I mean, I think it's not Senator Sanders that has made $15 minimum wage an issue. It's the Service Employees Union. I mean, they've been driving the car, and I mean, they've spent, depending on how you look at the government filings, anywhere from $40 to $80 million filling the tank over the last couple years. And so that's entirely focused on raising the minimum wage to $15 an hour, and that's a lot of money to spend, considering that their membership fell by a few thousand members last year. SALTSMANAnd so I think when you want to talk about what the future of the $15 minimum wage campaign looks like, I'd look to actually a critique that former SEIU president Andy Stern offered recently, where he said, you know, they can't keep doing this. They can't just keep spending money and not getting any return on investment. And so I think you might see the momentum stop if they decide to stop the money flow. REHMAnd you're listening to "The Diane Rehm Show." All right, let's go to Herndon, Virginia. Cordelia, you're on the air. CORDELIAThank you for taking my call. I don't know what I'm going to do with my mornings when you're gone, and I'll miss you so much. CORDELIABut I'm calling regarding the minimum wage. It's actually a very hot topic for me, and I've been trying to organize my thoughts. I am 60 years of age, currently at home on disability. I started work in 1973. The grand minimum wage was $1.75. So my first point is here is 1973, $1.75, and here it is in a new millennial, and it's not to $10. And people who are fighting against it obviously have never had to work for minimum wage. REHMWell, I'm sorry that you are out on disability now. Can you tell us what the last job you had was, how much that paid? CORDELIAWell, my last job was actually in an office with regular clothes and holidays off. I was a receptionist operator at Booz Allen. So it wasn't an hourly wage. REHMI'm glad to hear that. Has someone calculated a living wage? SPIELBERGAbsolutely that's true, and just to comment quickly on a point Michael made, giving credit where credit's due, I think people like Cordelia and Naquasia really deserve the bulk of the credit for the Fight for 15 movement and for pushing these sorts of increases and driving them in cities and states across the country. So I really commend them for that. SPIELBERGThere are a number of people who look at what a living wage could potentially constitute. MIT has a living wage calculator, and in 2014, if you look at California statewide, the living wage for a single parent with a kid was $25.26 an hour. New York statewide, a single parent with a kid in 2014 from MIT, they estimated that living wage at $26.19 an hour. And then if you even look at places in the state that are -- have lower costs of living, so like Bakersfield in California, the single parent with one kid, living wage would be $21.90 an hour. Or Hamilton County in New York, $22.16 an hour. SPIELBERGSo I think that really speaks to the fact that again, these increases, I think if you're viewing what we've done historically, you can definitely say they're pushing the boundaries a little bit of what we've done historically. But if you're looking at the minimum wage as what is the standard of living that workers should have, these increases can be viewed as a moderate compromise. REHMVery quickly, Michael, last word. SALTSMANI would just argue that there's nothing particularly about raising the minimum wage to more than double what the federal historical standard has been. And I think if you look at the Bay Area, I think if you look at other areas where they're experimenting with these very high minimum wage levels, you're seeing child care providers, restaurants, grocery stores, businesses cut back dramatically in response. And so I don't think that's a particular experiment we want to play with nationwide. BELLANTONII just think you should keep an eye on this in the cities, both in California and across the country, as people look to what happened. REHMAll right, Christina Bellantoni of the LA Times, Michael Saltsman of the Employment Policies Institute, Ben Spielberg of the Center on Budget and Policy Priorities. Thank you all so much. SPIELBERGThank you so much for having us. REHMAnd thanks, all, for listening. I'm Diane Rehm.